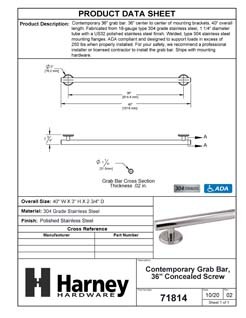 Bathroom Grab Bar, Contemporary, 36 In. X 1 1/4 In. Bathroom Grab Bar, Contemporary, 12 In. X 1 1/4 In. Bathroom Grab Bar, Contemporary, 18 In. X 1 1/4 In. Bathroom Grab Bar, Contemporary, 24 In. X 1 1/4 In. Bathroom Grab Bar, Contemporary, 30 In. X 1 1/4 In. Bathroom Grab Bar, Contemporary, 42 In. X 1 1/4 In. Bathroom Grab Bar, Contemporary, 48 In. X 1 1/4 In.